Fearless Girl vs. Charging Bull: Social Activism or Marketing Stunt? I rolled my eyes even harder. I regarded the whole thing as another feel-good piece of social activism for folks to pass around on Facebook and Twitter for a news cycle or two. But as with many things that get caught up in the social media hive-mind, the actual story is far more interesting than what the self-congratulatory Facebook posts and tweets would lead you to believe. The aspect that I find especially illuminating is that the financier of the Fearless Girl statue is not some Brooklynite guerilla artist- but an investment firm with $2.4 trillion under management. The plaque under Fearless Girl reads “Know the power of women in leadership. SHE makes a difference.” SHE, is not, in this case, the pronoun “she” capitalized for emphasis. SHE is the ticker symbol for a mutual fund. So Fearless Girl is in fact, a piece of marketing for a mutual fund. 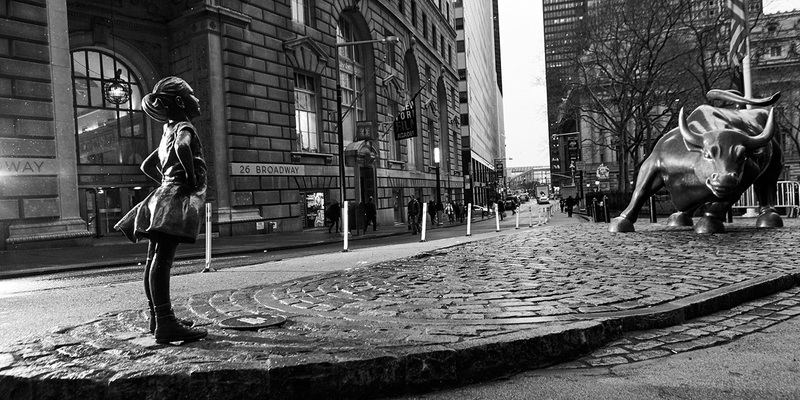 The original sculptor of Charging Bull, Arturo Di Modica is now pursuing legal action against the city and State Street for violation of his copyright, as he was neither consulted of about installation of Fearless Girl or compensated for being part of a marketing campaign. He’s been widely attacked on social media and by the mayor’s office for this move. For a more in-depth look at why Di Modica may be right, both legally and artistically, hop over to the great write-up done by the Manhattan-based writer and artist Greg Fallis. Whatever you think about Fearless Girl v. Charging Bull, I think this is yet another example of how easily nuance and context are lost in the social media age, and why maybe we shouldn’t be so quick to accept the first narrative we see. Next Is “The Last Jedi” Turning A Whole New Page?